Haute Beauty welcomes Dr. Dhaval Bhanusali to its exclusive network of beauty and wellness experts. Practicing Dermatology is an incredible privilege. I pride myself on staying at the forefront of the field, both practicing and developing the latest and most innovate procedures available. Dermatologist, Clinical Investigator and Laser Surgeon based out of Manhattan and Miami, Dr. Bhanusali is leading the next generation of cosmetic doctors, utilizing novel methods and the latest technologies to create results that were once thought impossible. He is quickly becoming the doctor of choice for young Hollywood celebrities, and models around the country. Aside from building a loyal following as a dermatologist, his contributions in digital health and technology have set the stage for future medical breakthroughs. He has helped run FDA clinical trials and been published widely throughout the most prestigious journals in Dermatology. He has worked with both the NY Mets and NY Yankees to promote safe skin practices and serves as a member of the AAD's media advisory team. 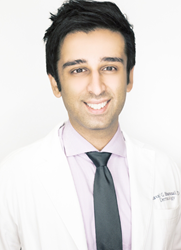 During his young career, Dr. Bhanusali has been featured on countless media outlets like Elite Daily, Buzzfeed, Yahoo, Askmen, the Atlantic, People Magazine, Teen Vogue, Bustle, Self, WebMD, and others. His novel laser techniques and humanitarian efforts were featured on TV networks around the country. His award winning research has been presented around the world and he currently serves as a medical expert for many powerhouse companies in the field, including Neutrogena, Clean & Clear, Aveeno, and Solta (which utilizes Fraxel and the Clear & Brilliant lasers). He specializes in medical and cosmetic dermatology and looks to bridge the gap between cutting edge technologies and established paradigms. As a member of the prestigious Medical Scholars program at Michigan State University, Dr. Bhanusali was accepted into medical school at the age of 17 and graduated college in three years. He was awarded both the Spartan scholarship, as well as the Arthur L. Foley, MD PhD scholarships for his outstanding academic achievements. After finishing medical school, Dr. Bhanusali completed his Dermatology residency at Mount Sinai hospital in New York City. With private offices in New York and Miami, Dr. Bhanusali also serves as faculty at Mount Sinai hospital in Manhattan. Haute Beauty is affiliated with luxury lifestyle publication Haute Living. A section of Haute Living magazine, Haute Beauty covers the latest advancements in beauty and wellness and provides readers with expert advice in the most innovative aesthetic and reconstructive treatments through its network of acclaimed surgeons.